Space holds a futuristic perception in public imagination. The endlessness summons you to explore, and the vastness demands you to reach beyond your comfort zone. In the absence of matter, a dreamer can conjure up thoughts of what can be. Star Trek encapsulated this mentality perfectly; from alien life to the potential for multi-species equality, anything was possible. That possibility provided a lens of what could be to the viewer. At age 12, I was a viewer peering through the lens of possibility. I watched a lot of television as a child. One of the many shows I watched was Star Trek: Voyager, the fifth show of the Star Trek franchise and the first to feature a female captain as a main character: Kathryn Janeway, the commanding officer of the USS Voyager. In the first episode, Janeway’s crew is lost in space and unable to return home — power struggles ensue and tensions run high. Throughout the episode, Janeway encounters hardships such as alien encounters and crew disagreements, but she ultimately prevails. By the end of the seven-season series, she becomes the first Federation captain to survive the Delta Quadrant, an unexplored quarter of the Milky Way. Not only did she bring her crew home, but her encounters with dozens of new planets and civilizations expanded the knowledge of Starfleet for generations to come. I have always been drawn to strong, complex female characters. Janeway was a woman who commanded hundreds of people in unfamiliar territory, all while rejecting traditional gender roles. She made the unconventional status quo and overcame hurdles women traditionally face in leadership roles. She was assertive and respected, confident in her abilities and position, and used her voice without shame — Janeway was a woman of the future. Being a leader requires a person to have a clear idea of what they want and where they want to go. Janeway did just this: she took risks, pushed away doubt, and charged for what she believed in. Lack of confidence is often an inhibitor of women’s advancement in the workplace. While a voice draws people’s attention, confidence is what keeps them listening long enough for someone to make an impact. A sense of belonging is imperative in gaining and maintaining that confidence. Although men frequently rise to positions of power even when unqualified, it is common for women to remain silent and feel less effective in their roles. Even in the middle of space, Janeway held strong. She remained confident in her ability to lead her crew back home and, although not immediately, she accomplished her goal. Without confidence, the outcome could have been much different. To Janeway, being herself was not a political statement. It was ordinary. She existed in a world where being a woman and a leader was not novel. I often think of an imaginary daughter and wonder if she could live Janeway’s reality. Today, there are still discussions surrounding if women can ‘have it all,’ if menstruation hinders work, and if child rearing is a distraction. If Janeway was inhibited by these discussions or these concerns, I do not believe she would have been so strong in her convictions. She taught me that being a female leader was normal. Women deserve to be ordinary. We deserve to not have people shocked when we are in positions of leadership. Space is daunting because it is seemingly endless, and the future is daunting because it is seemingly uncertain. However, regardless of endlessness or uncertainty, when we have a finite goal to achieve we are empowered to complete it. A goal makes our journey more concrete. For Janeway and her crew, it was finding their way out of the Delta Quadrant. For us, it is finding our way out of the clichés of popular rhetoric and finding the power within ourselves to break ancient insecurities and doubts that have plagued us. Seeing Janeway made me feel that I could do, or be, anything I wanted. I didn’t have to worry about acting ‘like a man,’ or making myself seem more palatable. I could simply focus on getting the job done. Nothing will change as long as we deem ourselves unworthy. It is time for us to teach ourselves that we deserve to be in those positions. 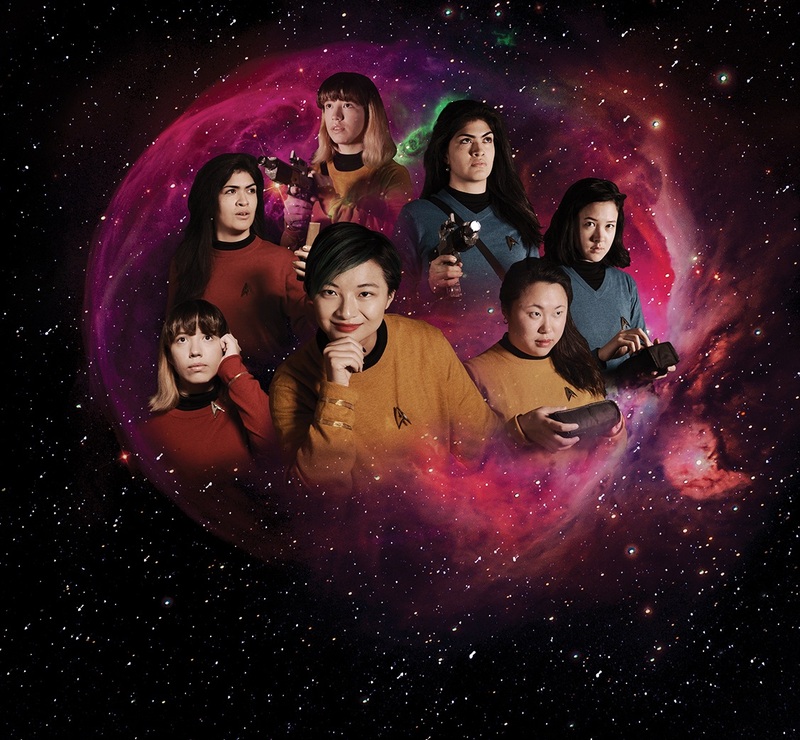 Whether it is promoting female camaraderie or heightening personal expectations — I believe this can be the generation where we can make Janeway’s reality our own. Janeway reflected the strong women in my life on a large, space-sized scale. Her abilities were never questioned because of her gender, and she was instead seen by the content of her character. This is the future I hope my daughter would be able to see.